April has started with a minor cold snap – nothing too drastic, but just enough to remind you that when the planting advice says “after all risk of frost has passed” we haven’t reached that point just yet, and might not until the end of the month. Hardier plants only for now, folks. March was a good month – or at least the second half of it was, after the wet and wild weather had passed – with a lot of infrastructure work moved forwards. 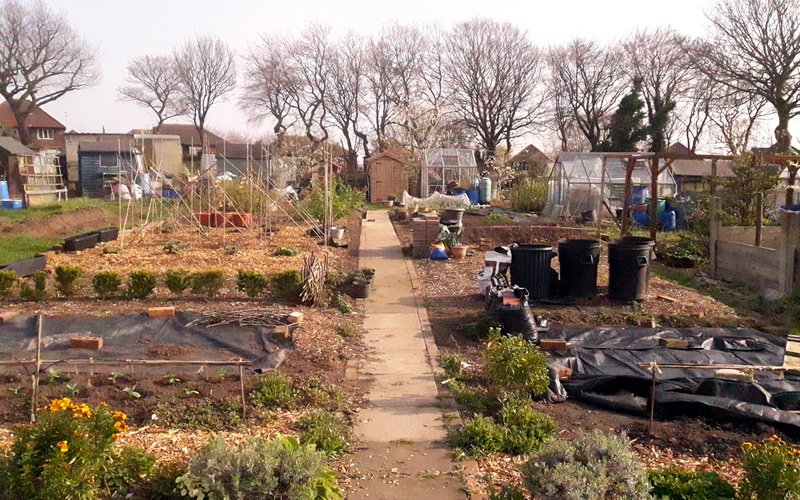 A lot of grass has been cleared and added to the hugelkultur bed, along with some well-rotted horse manure and rotted rhubarb root. I reckon that’s now ready for planting up, or will be once we have squash plants to plant into it. A delivery of wood chippings to the site (mostly Prunus laurocerasus and very leafy, but you work with what you’ve got) means I was able to replenish or lay down quite a lot of paths. 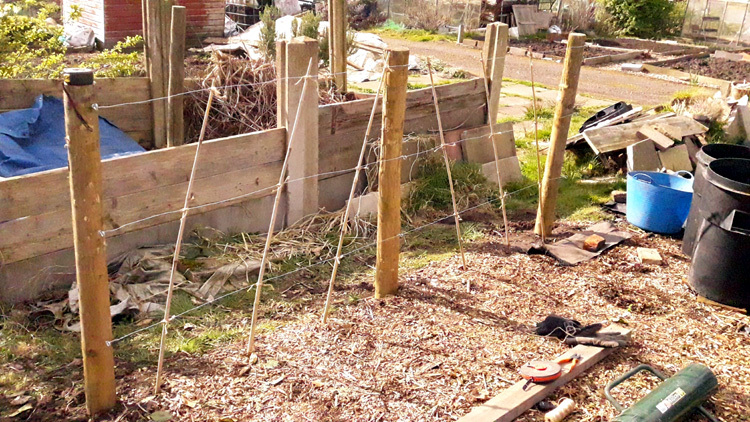 Speaking of paths, I also forged ahead with the flag path up the centre of the plot, as you can see from the photo at the top of the post. Just a few more to complete that one – plus the block pavers down the side to widen it to around 1m – and then I can start on the side path, eventually. I also planted out two more stepover apples and a dozen broad bean ‘Martock’ – a centuries-old variety that’s meant to produce small, but very tasty beans – sowed three rows of root veg, and continued harvesting last year’s leeks; just a dozen or so of those to go now. We’ll be planting our six cordon apples – grafted last year and started off in air-pots to help establish a healthy root system – at the weekend. More details to follow. Planting out those six cordon apples. Planting out potatoes. I’m steadily sourcing a few spare tubers from work, assorted varieties. Direct sowing More carrots (once I’ve topped up two carrot bins with fresh soil and drilled and filled a third) and more beetroot at the end of the month, in an attempt at successional sowing. Compost management. The black bins need to be emptied and / or transferred, and a new second-hand one that we acquired last year set up. Then the main bays need to be emptied into the black bins and/or turned one into the other. Not much action on the orchard plot last month. The plum, gage, damson and pears have put out blossoms, which will hopefully survive any frost this cold snap has thrown at them – but otherwise it’s all quiet. Additional stakes and ties – one or two of the young trees are growing away at odd angles. A fresh stake and a re-tie should help encourage them into a better growth pattern. Tree circle re-mulch – add a bit more composted bark where needed. Path repair – the flag path between plot #79 and the next-door neighbour is in a pretty poor state of repair. It needs lifting, digging out, re-sanding and re-laying. Potting up – tomato seedlings, and re-potting over-wintered chillis. Pricking out – lots and lots of onion and leek seedlings. Sowing – early cabbage, first batches of salad leaves, squash (patty pan and potimarron types), peas. Pot and label cleaning – it’ll have to be done as required now, rather than en-masse.